EXCAVATORS 40 E&MJ • NOVEMBER 2017 www.e-mj.com in Inner Mongolia, China, was also cov- ered by both E&MJ and Coal Age. The 56 th SRs2000-type machine to be deliv- ered by the company, it has a design ca- pacity of 6,600 lcm/h, and was specially designed and built to handle the harsh climate and the complicated geotechni- cal conditions with relatively flat, partly very wet and unstable slopes. 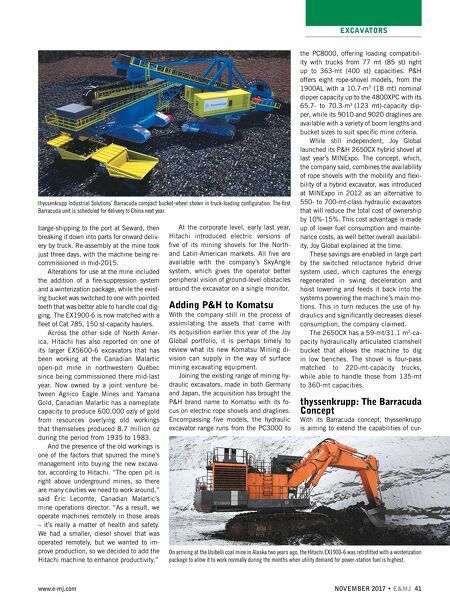 And, while rarely seen outside east- ern Europe and the CIS countries, Tenova Takraf believes that bucket-chain excava- tors can offer an interesting technical solu- tion to some of the specific requirements of various mining operations. The most significant advantage of these excavators is their low cut capability, the company told E&MJ, so mining or removing ma- terial from below the machine's working surface allows it to operate independently from wet and/or uneven bottom surfaces. Today, Takraf bucket-chain excavators are being used in a number of coal mines in Germany and Russia, cutting the coal seam closest to the pit bottom, as well as being used in reclaiming dried-out ash ponds. Given the recent focus within the industry on efficiency and cost-reduction, bucket-chain excavators are becoming in- creasingly popular for re-mining partially wet tailing dumps and ponds for repro- cessing, the company added. Planning for Selective Mining The German manufacturer of continuous surface miners, Wirtgen (which in June agreed a US$4.88 billion acquisition deal by Deere & Co.), has a three-model range, of which the 4200 SM is the largest. The company recently published a case histo- ry on introducing its continuous mining technology to an existing operation where traditional mining methods were in use, looking at the adjustments that needed to be made to the mine plan as well as the benefits claimed for the new system. The study focused on the New Hope Group's New Acland mine in Queensland, which has an output of around 5 million mt/y of thermal coal. In operation since 2002, the mine has to work within strict environmental limitations, with noise and dust emissions of particular concern. The deposit consists of stacked seams ranging from 900 mm to 3 m in thick- ness, with similar thickness partings, making selective mining very important. The mine was designed as a dozer-assist- ed shovel-and-truck operation, and while the dozer operators achieved good loss and dilution figures, the company wanted to improve coal recovery there. The 4200 SM began work at New Acland in mid-2014, selectively min- ing coal and partings. However, before it could do so, some adjustments were needed to the traditional mining system, which used 150-m × 150-m blocks. Giv- en the need to turn the surface miner at the end of each cutting pass, Wirtgen recommended that a 4200 SM should be put to work in blocks that are at least 300 m long, so the mine plan was altered to create 600-m-long runs for the machine. Wirtgen reported that the 4200 SM demonstrated reduced overall mining costs, reflecting the need for fewer machines for the same output, and hence lower fuel and labor costs. On average, the company said, the 4200 SM operated at around 60% low- er unit costs throughout the range of operat- ing conditions, while the continuous surface mining system also achieved better deposit recovery, so providing additional cashflow. Elsewhere in the world, Wirtgen has recently highlighted another operation where a 4200 SM has proved very suc- cessful. Cutting to a depth of 830 mm us- ing a 4.2-m-wide milling drum and oper- ating in an up-cut direction, the machine is used to selectively mine sub-bitumi- nous coal at North American Coal's Eagle Pass operation in Texas, which provides power-station fuel for export to Mexico. The 6-m-thick horizon being worked contains four seams, some parts of which are only 150 mm (6 in.) thick. Mining and loading about 95% of the mine's coal output directly, the surface miner also crushes the coal to a maximum size of 100 mm while minimizing fines that could cause blockages in materials-han- dling equipment. Thus the mine does not need to do any blasting, nor has a primary crusher installed, Wirtgen noted. 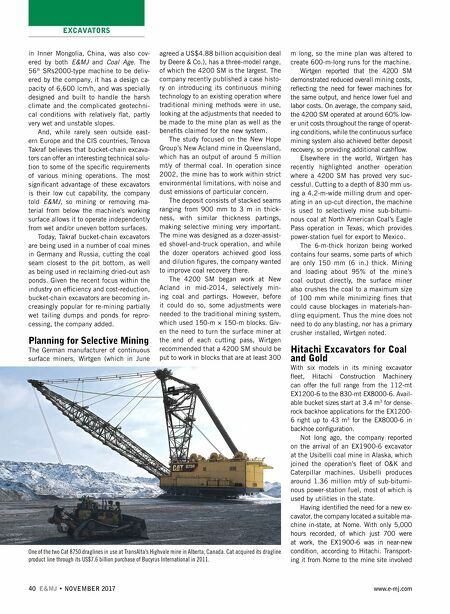 Hitachi Excavators for Coal and Gold With six models in its mining excavator fleet, Hitachi Construction Machinery can offer the full range from the 112-mt EX1200-6 to the 830-mt EX8000-6. Avail- able bucket sizes start at 3.4 m 3 for dense- rock backhoe applications for the EX1200- 6 right up to 43 m 3 for the EX8000-6 in backhoe configuration. Not long ago, the company reported on the arrival of an EX1900-6 excavator at the Usibelli coal mine in Alaska, which joined the operation's fleet of O&K and Caterpillar machines. Usibelli produces around 1.36 million mt/y of sub-bitumi- nous power-station fuel, most of which is used by utilities in the state. Having identified the need for a new ex- cavator, the company located a suitable ma- chine in-state, at Nome. With only 5,000 hours recorded, of which just 700 were at work, the EX1900-6 was in near-new condition, according to Hitachi. Transport- ing it from Nome to the mine site involved One of the two Cat 8750 draglines in use at TransAlta's Highvale mine in Alberta, Canada. Cat acquired its dragline product line through its US$7.6 billion purchase of Bucyrus International in 2011.